Russia has stepped up its attacks on Islamic State (IS) targets in Syria, dispatching long-range bombers and firing a volley of cruise missiles. The strikes follow a statement by Russia's security chief that a bomb brought down a Russian airliner over Egypt last month, killing 224. Sinai Province, an IS-linked Egyptian group, said it had downed the jet. 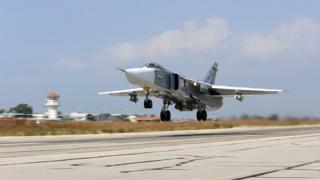 Russian officials say the country's air force has flown 2,300 missions over Syria in the past 48 days. In response to Friday's terror attacks in Paris, which killed 129 people and wounded a further 352, Russian warships have been ordered to work "as allies" with their French counterparts in the Mediterranean. Speaking at a security meeting held on Monday night, Russian President Vladimir Putin said the country's air campaign in Syria would intensify. "The combat work of our aviation in Syria should not only be continued, but it should be intensified to make the criminals understand that vengeance is imminent," he said. Sinai Province said in a statement that the attack on the Metrojet airliner was a response to Russian air strikes that had killed "hundreds of Muslims" in Syria. On Tuesday, FSB chief Alexander Bortnikov said that "traces of foreign explosives" were found on the wreckage of the plane. Mr Putin vowed to "find and punish" those behind the attack. As well as targeting IS, Russian warplanes are supporting Syrian government forces against various rebel groups - a source of tension between Mr Putin and his US and UK counterparts. France has also vowed to intensify air strikes against IS after Friday's attacks in Paris were linked to the group. At least 129 people were killed in several co-ordinated attacks in the city and a further 352 injured. Both Russian and US officials have said they will coordinate closely with France to target IS in the wake of the attacks in Paris. 13 Nov - Paris, France Gunmen and suicide bombers kill at least 129 people. 12 Nov - Beirut, Lebanon Suicide bombers kill at least 43 people. 31 Oct - Sharm el-Sheikh, Egypt Plane crashes killing all 224 on board. Russia says a bomb caused the crash and an IS affiliate says it was responsible. 10 Oct - Ankara, Turkey Suicide bombers kill 102 people at peace rally. Turkey blames IS, but no group claims the attack. 18 Jul - Khan Bani Saad, Iraq Car bomb kills 120 people. 26 Jun - Sousse, Tunisia Gunman kills 38 people, mostly British tourists. 26 Jun - Kuwait City, Kuwait Suicide attack kills at least 27 people. 22 May - Qatif, Saudi Arabia Two suicide bombs kill at least 21 people. 21 Mar - Sanaa, Yemen Suicide bombings kill at least 137 people. 18 Mar - Tunis, Tunisia Gunmen kill 19 people, mostly foreign tourists. Correction, 18 November: In an earlier version of this story, we reported that the Russians had launched missiles from a submarine in the Mediterranean. This was based on reports on the Russian media which we now believe to be incorrect.